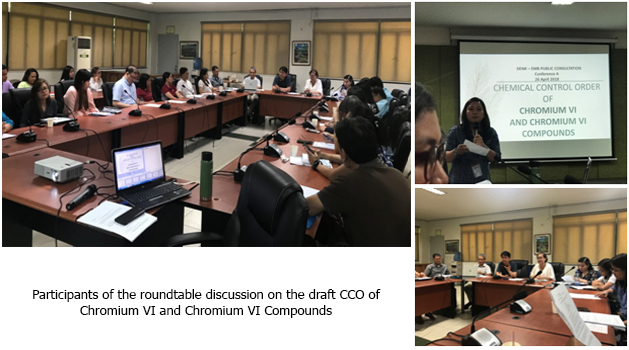 The Environmental Management Bureau (EMB) of the Department of Environment and Natural Resources (DENR) conducted a consultative meeting on the draft CCO of Chromium VI and Chromium VI Compounds on April 26, 2018 at the EMB Conference room A, Air Quality Management Training Center (AQMTC) Bldg., DENR Compound, Visayas Avenue, Quezon City. Draft policy was presented by Ms. Emmanuelita Mendoza of the EMB-Chemicals Management Section (CMS) followed by an open discussion. Based on the current list of registrants, twenty (20) chemical substances and compounds will be subjected to the CCO once finalized. The consultation was attended by representatives from the industry, industry (SPIK, PCAPI) and professional organization (ICP), government agencies (BOI, PEZA, BOC, DOLE-BWC, DOLE-OSHC, EMB) and non-governmental organization (Ban Toxics).